In today’s episode of PianoTV, we’re going to look at Impressionist music. We’ll talk about the composers who played a role in this sound movement (namely Debussy), what the impressionist style sounds like, and characteristics of the music. We’ll also use plenty of examples of impressionist music so that you can get a sense of the era in your ears. Whether you’re studying for a test, or are just learning about music history because it’s awesome and exciting and you love music, I hope this post/video will be useful to you. At the end I’ve also included an impressionist playlist to get you going (on Spotify). It all began with Monet’s painting: Impression, Sunrise. Monet, as you probably know, was the most famous Impressionist painter, and the term was borrowed from that painting. The whole idea with Impressionism was that musicians – and artists – were drawn to conveying moods with their music, instead of distinct melody lines. They wanted their pieces to evoke a feeling. So this music (and artwork) was less fixated on details and making things “perfect” – oftentimes the music is just the opposite, vague and blurred – but still incredibly impactful. Instruments were played in new ways, like flutes and clarinets playing darker, lower sounds. The harshness of horns were mellowed by being muted. Tinkly, shimmery instruments were often used, like the harp, triangle and glockenspiel. Up until this point, chords hadn’t really gone wild. We had lots of chords, sure, like minor 7ths and diminished chords and all that, but we didn’t start getting 9ths, 11ths and 13ths in earnest until the Impressionist era. These are regular chords that basically get notes added to them in intervals of 3, to make them less clear and dissonant. Another common thing with chords during this time is that they didn’t always resolve in a “proper” way, a la cadences. Impressionist music really liked going outside of the key box. Most of us are familiar with the whole major/minor modality – where a song is based in a specific key, and it’s a major or minor key. Impressionist composers liked to write songs that weren’t in any key at all – and we call that atonality. Another way composers escaped the major/minor modality was to explore different harmonies and keys. This led to a return to more ancient styles, like medieval music, which was centered around unusual harmonies like fourths and fifths (as opposed to thirds, which we’re used to). Exotic Eastern scales came into play, such as the whole-tone scale, which Debussy was fascinated by. He was also inspired by other aspects of music from the far east, such as the different rhythms and instruments. The pentatonic scale is a 5-note scale (penta = 5) that originates with folk music from Scotland, to Ireland, to China. This scale was often employed in Impressionist music. A lot of impressionist music lacks a steady, defined rhythm. It’s fluid and changeable – not the kind of music you tap your toes to. The Impressionistic Period began in the 1870s-1880s with painters like Monet, and ended around the 1920s-1930s. 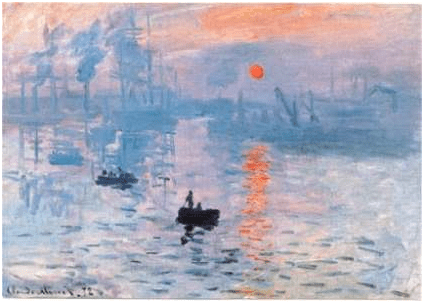 Of course, impressionist music carried on beyond that, in its various off-shoots like neo-impressionism, but I like to think of the dates of impressionism coinciding with Monet’s Impression, sunrise painting, and Monet’s death. The style of impressionist music isn’t deeply emotional and personal like the bulk of Romantic Era music. Romantic music was very focused on storytelling, with highly emotive themes – everything from joy to sorrow to rage to death. Impressionist music doesn’t get personal in the same way. It’s like the difference between a detached observer of a story – a third-person narrator – compared to a first-person, up-close-and-personal account. When you have a first-person narrative, the main character is fully submerged in the story, and thus subjective. Impressionist music is like the distant narrator. They see the story unfold, and they take a musical snapshot of it from a distance. They capture its essence and entirety. But they’re not in there getting their hands dirty. Claude Debussy and Maurice Ravel were the main men of impressionist music. 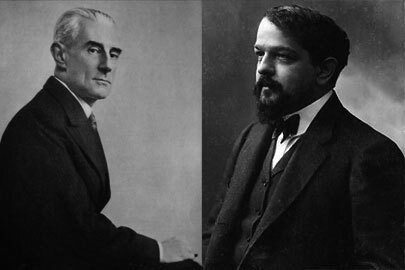 They were both French composers active at the turn of the 20th century (and beyond). Debussy really didn’t like when his music was referred to as “Impressionist”, however. He much preferred the term “Symbolism” when referring to his music, as that was a literary movement that directly inspired him. Noted. Debussy thinks we’re imbeciles. Let’s carry on. Debussy was a gifted pianist and an intrepid musical explorer. He didn’t set out to write Impressionist music (as we’ve established, he hated that comparison) – rather, he was just interested in pushing boundaries and exploring new sounds. He went to a French music academy, but felt stifled by the teachings, finding them to be too old-school. Early works he wrote while at the school were deemed “bizarre”, and “courting the unusual”. When we talk about what composers are inspired by, a lot of times the answer is religious – for example, many composers were inspired, and wrote for, God. (Some were inspired by their pets). For Debussy, however, his religion was “mysterious Nature”. This was a major source of inspiration for his compositions (La Mer, Clair de Lune, etc). Let’s take a listen to the first arabesque from Debussy’s Deux Arabesques. This is a very popular piano piece that covers many impressionist music characteristics – the harp-like undercurrent, the pentatonic movement in the right hand, and a rhythm that lacks a driving beat, and is more free-form. Composed by Claude Debussy (1862-1918). Edited by Lynn Freeman Olson. Masterworks; Piano Collection. Alfred Masterwork Edition. Impressionistic; Masterwork. Book. 16 pages. Published by Alfred Music (AP.2540). Maurice Ravel was in the generation after Debussy, and is considered one of France’s greatest composers. Like Debussy, Ravel didn’t enjoy the “Impressionist” comparison. They were acquainted with each other and had other things in common, like being musical rule-breakers and not being suited to conservatory life. The problem is, because of all their similarities, their supporters became rather divided – like, “If you like Debussy then you stink, because obviously Ravel is the best”. Kind of like the Backstreet Boys and NSync in the 1990s. So the two of them, instead of being friends, ended more as rivals. One difference between the two is that Ravel was more of a Classicist – he liked taking old forms and revitalize it with something new and fresh. For example, he was inspired by jazz music in later life, and incorporated jazz elements into his piano concerto. But the piece I want to show you of Ravel’s is my personal favorite, and therefore is maybe a more unusual choice. Piano Solo. Composed by Maurice Ravel (1875-1937). Edited by Peter Jost. Piano (Harpsichord), 2-hands. Henle Music Folios. Classical. Softcover. 24 pages. G. Henle #HN841. Published by G. Henle (HL.51480841). The last example we’ll listen to is a work that was highly praised by Debussy, among others, as being one of the most brilliant piano works. It’s extremely difficult, and it’s Albeniz’s Iberia Suite. It’s also very long, being a collection of 12 pieces. It was written between 1905-1908, and exemplifies that Impressionist style, but from the perspective of a Spanish composer. The piece from Iberia we’ll be listening to is El Puerto, based on a Spanish dance style called the zapateado. I wanted to throw this example in there to show that not all Impressionist style music is beatless – this one definitely has rhythmic flair. But you’ll also pick out some unusual chords and harmonies in there, especially if you listen to the full version (beyond the clip I’m going to show you). Composed by Isaac Albeniz (1860-1909). Masterworks; Piano Collection. Dover Edition. Classical Period. Collection. With standard notation, fingerings and introductory text (does not include words to the songs). 186 pages. Published by Dover Publications (AP.6-253678). Instead of just showing you a few musical examples and leaving it there, I decided to make an Impressionist Spotify playlist with a bunch of pieces that I feel demonstrate the era. There are 32 pieces on the playlist, about 3 hours of music, so if you’re wanting to get a full, immersive experience of the genre, check it out! And that concludes today’s discussion on Impressionist music. I hope you’ve found it helpful – maybe you’ve even found some new piano music to aspire to, or jam out to.